4-5 tablespoons of oil e.V. Does that sound strange pairing garlic and almonds? Well, not the result!. In Italy we use it ourselves in the Sicilian pesto. And so the Spanish in their typical "Ajo blanco". A classic cold soup made ​​from almonds, garlic, water, bread, vinegar and oil. Tasty, refreshing and with the acid of the Jerez vinegar. 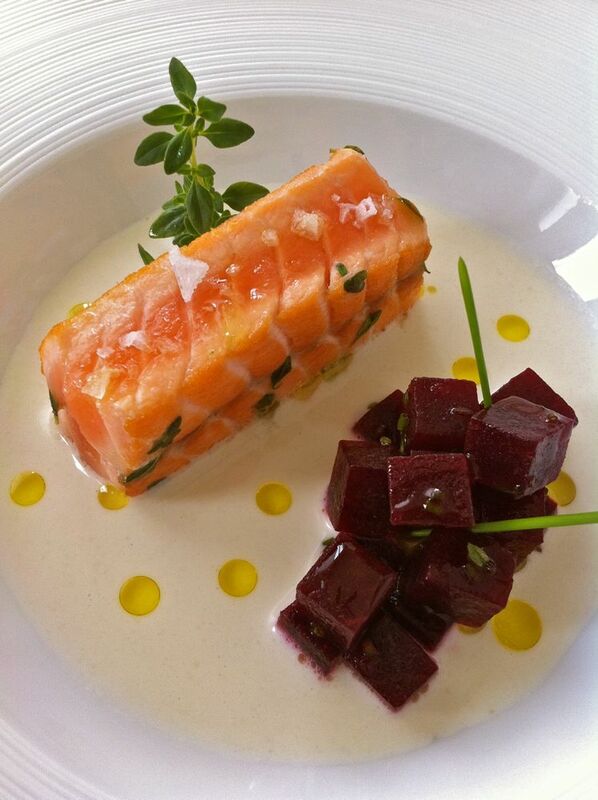 A good combination for a fatty fish such as salmon. Indeed, the fattest of all. I I really like it raw or semi-cooked and so I will propose it to you today. 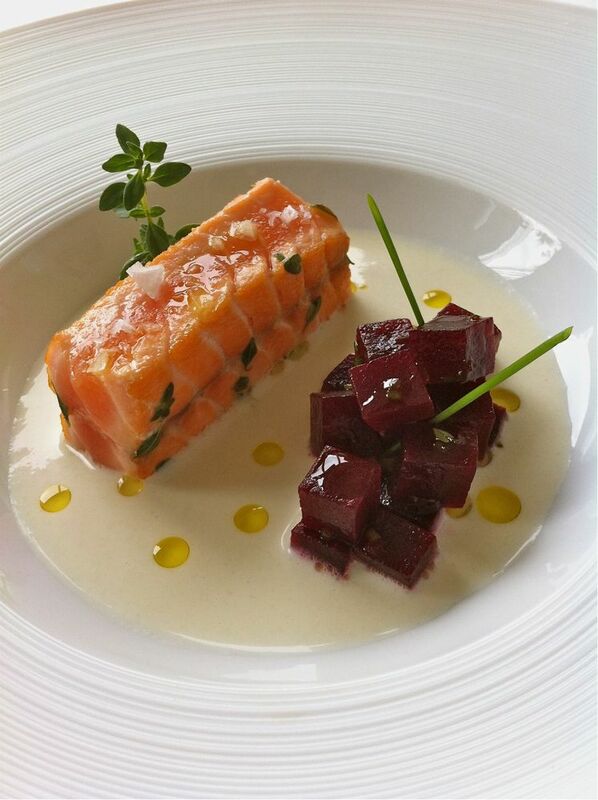 The salad of beetroot will soften with its naturally sweetnes, the cloying flavor of the fat salmon and the acidity of the soup. In proportion to our pesto sauce, the taste of garlic is less strong. But if you really want to lighten it up, boil the garlic for a couple of minutes before adding it to the rest. Possibly the night before, leave to soak the almonds with water and bread. Then blend it all adding oil, vinegar and salt. Drain with a fine strainer and squeeze all till the last drop with the help of a ladle. Let it sit in the fridge. Sprinkle the salmon pieces with leaves of lemon thyme and put them on the grill for half a minute on both sides. 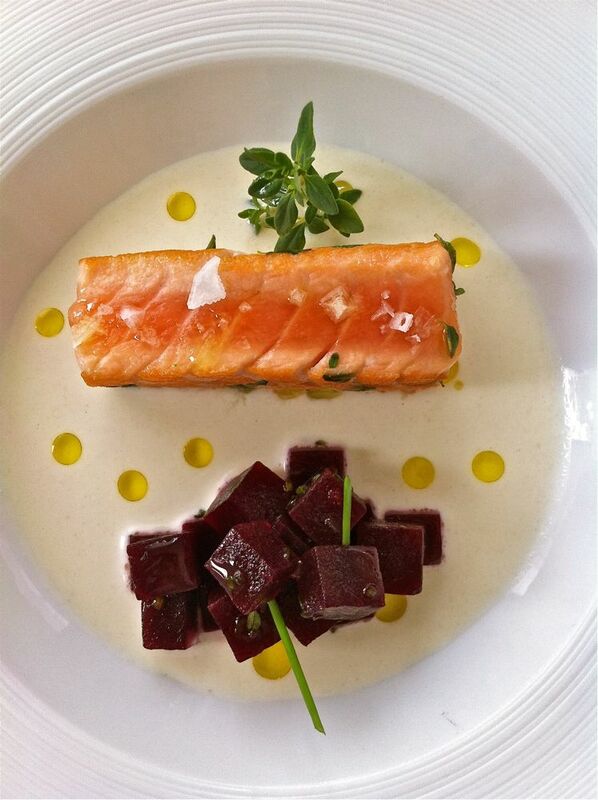 Serve in a bowl with salt flakes, the cold soup and the diced beetroot seasoned with olive oil, salt and chives.